Dr. Sandy Liu is a board-certified physician in oncology. She completed her oncology fellowship at UCLA and Internal Medicine residency at Cedars-Sinai Medical Center. She earned her medical degree from George Washington University in Washington D.C. and her bachelors of science in biology at University of Southern California. 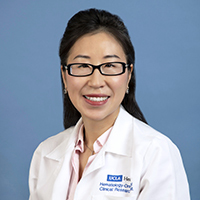 Dr. Liu practices general oncology and specializes in genitourinary (GU) cancers which include cancers of the kidney, prostate, bladder, testis, and urethra. She is the sponsoring physician for UCLA VHL Comprehensive Clinical Care Center, which includes a team of VHL specialists working together to provide coordinated care to ensure VHL patients receive access to services and adhere to surveillance guidelines. Dr. Liu is passionate about advancing the field of cancer treatment and is involved in clinical trials, with research interests in immunotherapy and drug development. She is committed to providing high-quality, personal care to patients and their families. Dr. Liu is on staff at Ronald Reagan UCLA Medical Center, Santa Monica UCLA Hospital and Providence Tarzana Medical Center. In her free time, she enjoys attending plays and concerts, reading and traveling. She is fluent in English and Mandarin Chinese. She looks forward to providing excellent care to each and every one of her patients. Liu ST, Pham H , Pandol SJ, Ptasznik A.Src as the link between inflammation and cancer. Front Physiol. 2014 Jan 16;4:416. Wirtschafter E, Walts AE, Liu ST, Marchevsky AM. Diffuse Idiopathic Pulmonary Neuroendocrine Cell Hyperplasia of the Lung (DIPNECH): Current Best Evidence. Lung. 2015 Oct;193(5):659-67. Liu ST, Cadaneanu RM, Zhang B, et al. Keratin 13 Is Enriched in Prostate Tubule-Initiating Cells and May Identify Primary Prostate Tumors that Metastasize to the Bone. PLOS One. 2016 Oct 6;11(10). Sandy T. Liu and Alexandra Drakaki. (2016). Renal Complications. In Manual of Clinical Oncology, Eight Edition. Philadelphia, PA. Lippincott Williams & Wilkins.